If you're not a headphones person, you're either dealing with terrible laptop speakers or maybe the awful ones built into your monitor or all-in-one PC. If that's you, then you're most likely in need of some great external speakers. You also don't want to spend a fortune on a Harmon Kardon 5.1 surround system, so we rounded up some of the best computer speakers for under $100. 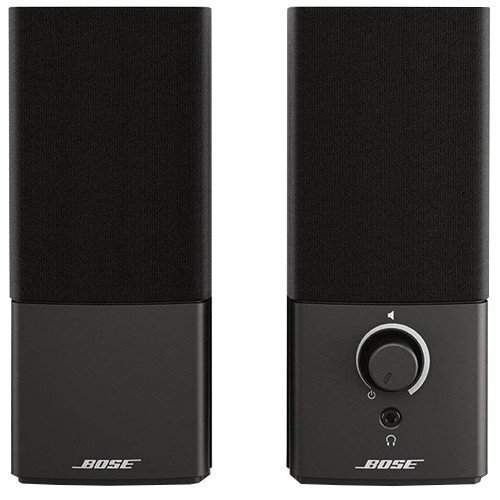 If you want great sound quality and value, then you want Bose. Some audio snobs might look down on Bose, but there's no denying that they produce pleasing sounds that put the company at the top of the consumer speaker game. You too can have room-filling, immersive sound, so Bose says in every advertisement. The Edifier Exclaim e10 speaker system won't take up a lot of room on your desk, but it'll deliver a lot of sound. Each speaker has two 1.5-inch tweeters in the upper part, plus a 3-inch woofer in the bottom part for balanced sound. Perfect for those cluttered or compact desks. If you already have a considerable amount of audio equipment laying around, you may be looking for speakers with many connectivity options. The Mackie CR3 speakers have auxiliary in and headphone out ports on the front, plus TRS and RCA in on the back. There's even a switch to select which side the powered speaker is on. This 3-piece set from Cyber Acoustics comes with two satellites and a wood cabinet subwoofer for 30W (62W peak) of powerful sound — for the price. There's also a handy desktop control pod, which controls power, volume, and bass. Plus, it has a headphone jack and auxiliary port. These speakers not only sound great but look great as well, with their modern design and aluminum-finished pedestals; a gorgeous addition to your desktop. These 2-way speakers look awesome and Creative makes relatively inexpensive products that sound great. You get volume, bass, and treble control right on the front of the right speaker, and each speaker produces clean, crisp audio that'll impress, considering the price tag. This model has also been around for almost a decade, making them tried and tested. Genius jumps in with another excellent 2.1 channel system that offers total clarity at any volume. You've got a 5.25-inch bass driver in a fairly compact subwoofer, two 3-inch drivers in each satellite speaker, and a total output power of 38 watts. What does that mean? It means you've got great low-end and enough juice in the system to likely fill your whole home with sound. These are the coolest-looking speakers in our roundup, but they're not all flash and guile – these babies can hum. With a name like "BassPULSE," you shouldn't expect anything less than deep, warm, rich bass tones, and GOgroove doesn't disappoint. Despite how thin the satellite speakers are, they still produce decent high-end and mid-range tones and are better than you'd expect from most thin plastic speakers. You'll buy them for the looks more than anything. The Z313 system comes with a powered subwoofer and two satellite speakers to deliver 25 watts of total power. That's enough to fill your room and then some. While the full range sounds excellent at normal volumes, the highest of the high-end does fall a bit flat and can get pretty tinny at very high volumes. Fiddling with the equalizer sorts this issue out, however. The T12 by Creative is an affordable speaker solution, consisting of just two units with built-in Bass Flex technology. Priced competitively, these aren't the best speakers on the market and if you're an audiophile you'll probably want something a little more expensive, but if you want to spend less than $100 these are some excellent drivers. In the case of most consumer goods, you're paying way too much for whatever you're getting and you often get much more for much less, depending on the product. With speakers, you really do pay for what you get. If you're spending under $100, don't expect anything absolutely ground-breakingly spectacular, but don't expect total crap either. Spending an extra $50 to $100 unlocks another tier of great-sounding speakers that will likely surpass this list. That being said, if your budget is tight, these are the tops and Bose takes my personal number one spot with the excellent Companion 2 system.